anyway, About 2 months ago I went and painted one of my forearms with spacewolf grey latex gloss house paint. The stuff is crazy! I will never use rattle cans, or the Norwegian Paintbrush to paint the main colors of foam armor again. You can flex the suit and the paint wont crack like Fusion or american Accents does. Great idea man to use house paint! Good it worked! However, I will never use the kind of paint i used again. (Regular indoor water based wall paint.) The propblems with it sticking to itself, and tearing off is horrible. (Two armor pieces pressed together for a while.) Even when clear coated I still have that problem. I recommend regular spray cans. That is interesting, I started using house paint on mine about half way through. It is cheaper, but I can see that it does grab and squeak a bit more. I haven't had it tear yet. Maybe it was the brand. I'll keep an eye out though for it happening, good looking out! 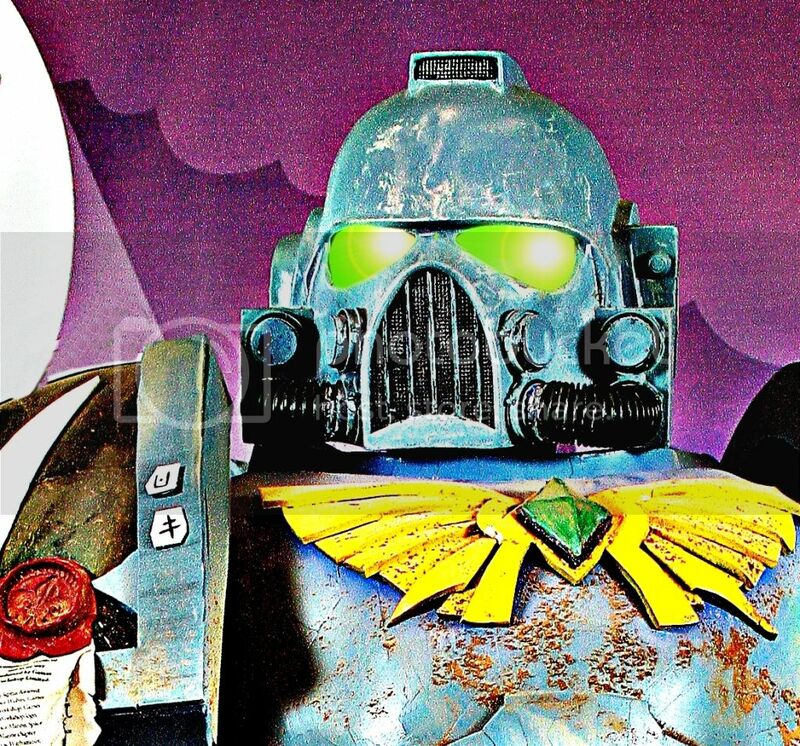 I'm new to using the Pepakura files (and this forum) I have never built any space marine armour but I do have years of costuming experience. I am really looking forward to starting a suit but I can't figure out how big to make it. I am a big guy (6' 5" and 270 lbs) so I was wondering what number I should set the scale to? If Henrik is 6'0" and the scale is set for 935 for a 7" suit what should i set it for to get a 7'6" (or bigger) suit? Any help would be greatly appreciated. Thanks a lot for the response, I had read it several times but it took two more re-reads of the "scaling the armour" section for it to sink in that 1 cm = 4.4 scale units. I guess that I was thinking that the 935 number was a ratio or a multiplier itself and I was looking for something more complex. Now that I found the scale I was doing some math. 935 / 4.4 = 212 cm (210 in the description) = 83" or 6' 11". Changing it to 950 would only add 3.4 cm (1.3") to the total height. I am 195cm and Henrik is 183 so I am 6.5% taller to start with. If I want the suit to be 6.5% bigger than his it should be at about 15 cm taller or 7'5" total. In order to get a nice even 7'6" it looks like I would have to use about a 1000 scale. (7'6"= 90" x 2.54 = 228 cm x 4.4 = 1005.) Let me know if there is some flaw in my thinking here. One more quick stupid question for Henrik, I was trying to figure out the height of the platforms under your shoes from your pictures. (and therefore figure out how tall mine should be) It looks like about 25 cm, Is this correct? There are many things that will affect the final height. Your build scale is important but depending on your stilt height and armor gaps your height will change. Heck.. My helmet even adds inches My own build is 935 scale, I am 6', and my final height is over 7ft. This is slightly taller than Henrik even though we used the same scale. Many factors to consider, probably too many to be extremely accurate in calculating final height. Best we can do is estimate. Henrik you are my hero. We should stop jacking this thread now. Sorry for the "hijack", LOL, I will start another thread somewhere else and ask my Noob questions there. I made some slight additions to my download, regarding using, and reinforcing styrofoam for details/builds. And some more pictures of the finished armor from front, back and sides. your build is still so freaking awesome! I don't really have any thing to add other then that, your improvemnts have taken it to an other level and your painting is top notch. thank you for sharing your hard work with us! Glad to help make an army for the Emperor! I have a new video added to the playlist, from the latest convention. Hi Henrik...I just downloaded your updated documentation about your build and just wanted to ask you...which stilts do you prefer? The old one with the orange pipe or the new foam block? Did the foam last?